The heart of the debt problem is this: You can’t get elected unless you promise people things you can’t possible deliver without massive debt spending. 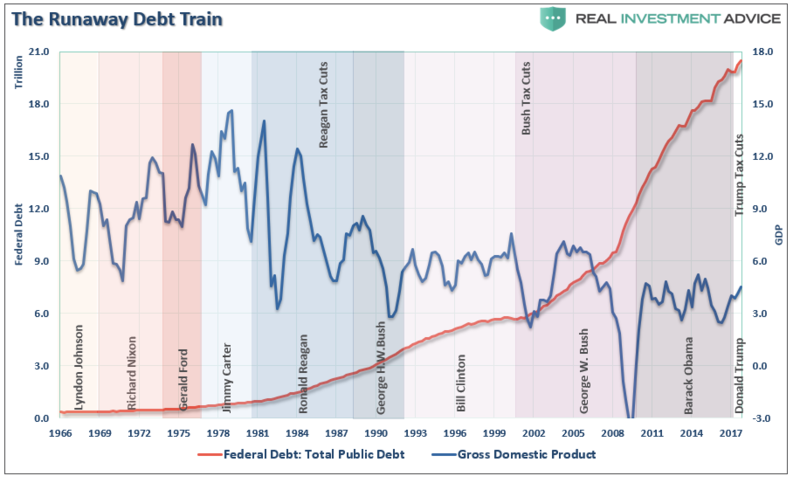 Nobody wants to admit the simple mathematical truth: Someone has to pay for the debt incurred by past administrations. In the future, people will have to pay more to get less. It’s not a negotiation. It’s math. But no politician can get elected on this platform. So sooner or later, the math is going to force the hand of whichever president is unlucky enough to be in office when the debt music stops and the whole charade comes crashing down. There is a huge debate over “Austerity” versus “Spending.” While conservatives in government talk a “good game” about cutting spending, budgeting and debt reduction, the exact opposite has been the case over the past several Administrations both “conservative” and “liberal” alike. The irony is that increases in debt lead to further increases in debt as economic growth must be funded with further debt. As this money is used for servicing debt, entitlements, and welfare, instead of productive endeavors, there is no question that high debt-to-GDP ratios reduce economic prosperity over time. In turn, the Government tries to fix the “economic problem” by adding on more “debt.” The Lowest Common Denominator provides more information on the accumulation of debt and its consequences. The U.S. has the labor, resources, and capital for a resurgence of a “Marshall Plan.” The development of infrastructure has high rates of return on each dollar spent. Instead, the government has spent, and continues to spend, trillions bailing out banks, boosting welfare support, supporting Wall Street and reducing corporate tax rates which have a negative rate of return. In the meantime, the aging of the population continues to exacerbate the underfunded problems of Social Security, Medicare, and Medicaid which is roughly $70 trillion and growing. It is simply a function of demographics and math. At some point, the realization of the “real American crisis” will be realized. It isn’t a crash in the financial markets that is the real problem, but the ongoing structural shift in the economy that is depressing the living standards of the average American family. There has indeed been a redistribution of wealth in America since the turn of the century. Unfortunately, it has been in the wrong direction as the U.S. has created its own class of royalty and serfdom.